This species is accepted, and its native range is Hawaiian Islands, Canada to Mexico, Hispaniola. Annual, or perennial; caespitose. Culms 20-70(-120) cm long. Ligule an eciliate membrane; 1.5-3 mm long. Leaf-blades 4-10(-15) cm long (basal blades); 2-8 mm wide. Inflorescence a panicle. Panicle open, or contracted; lanceolate; 5-25 cm long. Primary panicle branches appressed. Spikelets solitary. Fertile spikelets pedicelled. Pedicels linear; 0.2-2 mm long. Spikelets comprising 2-3 fertile florets; with a barren rhachilla extension. 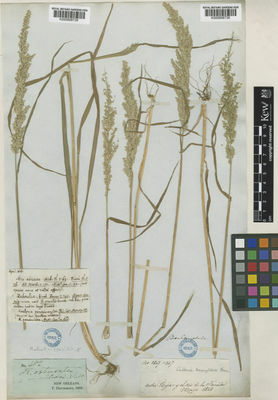 Spikelets obovate; laterally compressed; 1.5-5 mm long; falling entire. Rhachilla internodes 0.3-1.2 mm long; smooth, or scaberulous. 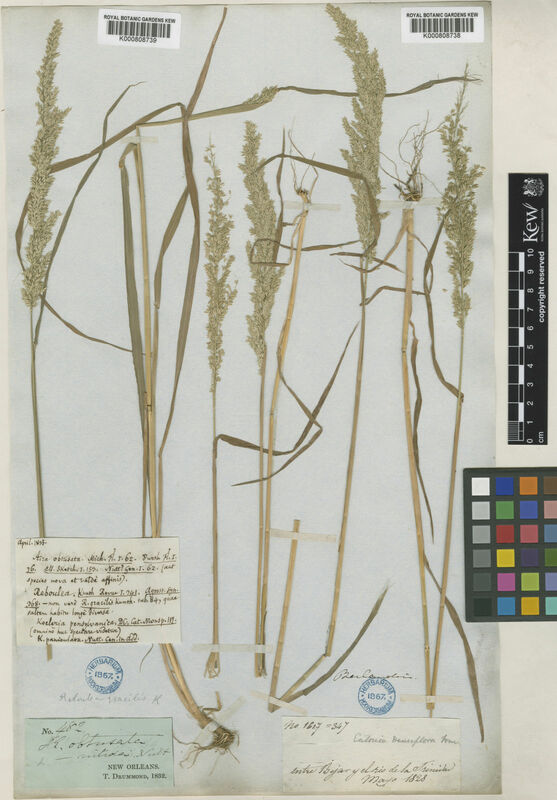 Glumes dissimilar; with lower narrower than upper; shorter than spikelet; gaping. Lower glume lanceolate; 1-4 mm long; 0.9 length of upper glume; membranous; 1-keeled; 1 -veined. Lower glume primary vein smooth, or scaberulous. Lower glume lateral veins absent. Lower glume apex acute. Upper glume obovate; 1.2-4.2 mm long; 0.8 length of adjacent fertile lemma; membranous; 1-keeled; 3 -veined. Upper glume primary vein scaberulous. Upper glume surface smooth, or asperulous; rough on veins. Upper glume apex obtuse, or acute. Fertile lemma ovate; 1.4-4.4 mm long; membranous; keeled; 5 -veined. Lemma surface smooth, or scaberulous. Lemma apex obtuse, or acute. Palea gaping; 0.8 length of lemma. Palea keels scaberulous. Rhachilla extension 0.75 length of fertile floret. Caryopsis with adherent pericarp; oblong; glabrous. Endosperm liquid. Pacific: north-central. North America: western Canada, northwest USA, north-central USA, northeast USA, southwest USA, south-central USA, southeast USA, and Mexico. South America: Caribbean. Lower glume less than 0.33 width of upper. Aira mexicana Trin. ex E.Fourn. Eatonia pubescens Scribn. & Merr. Koeleria obtusata Trin. ex Steud. Reboulea obtusata var. lobata (Trin.) Farw. Reboulea obtusata var. pubescens (Scribn. & Merr.) Farw. Sphenopholis obtusata subsp. lobata (Trin.) Scribn. Sphenopholis obtusata subsp. pubescens (Scribn. & Merr.) Scribn. Sphenopholis obtusata f. purpurascens (Rydb. & Shear) Waterf.